Alas, yesterday would have been an awesome day to have a kid. It was Friday the 13th, the moon was full, and Lilbit has referred to the baby as her ‘smooky baby’ since December. As this always struck me as a portmanteau of ‘smoky’ and ‘spooky’, it gave me hope! Plus, it’s sort of ‘my’ holiday; when I was in school, I threw a sleepover most every single Friday the 13th, and I was a goth in high school. It would have been most mete, but ah well — babies come when they’re ready, and this one seems to be happy moving into overtime jabbing at me through the skin. As it were though, I’m not feeling too antsy now that I know the end is properly in sight. And also, because we got an unexpected child-free night last night. Lilbit is a good kid, but I think she’s been picking up on our antsy and acting it out, and a night without her in the house was very soothing to myself and the husband-fellow. So for now, I’m just keeping myself distracted with crafting. 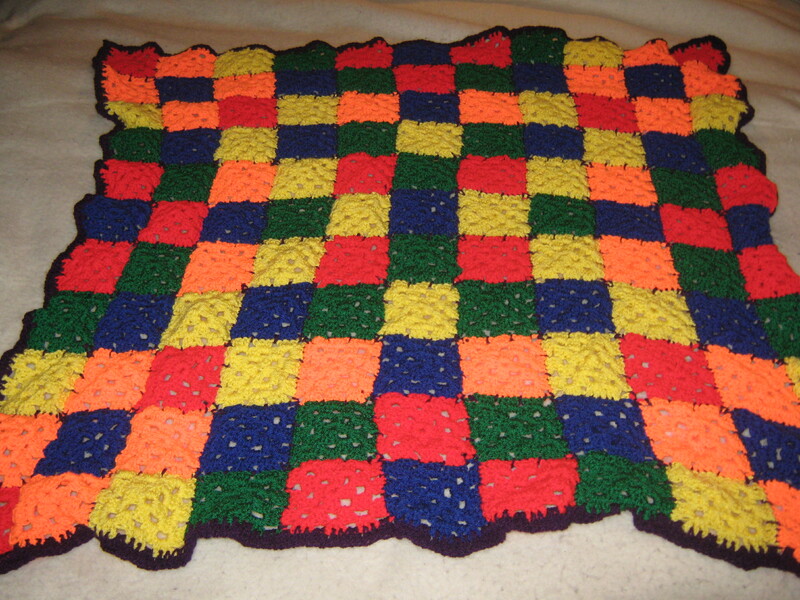 I’d initially done a crochet blanket for the little one to match the one I did for Lilbit. It’s the same ‘pattern’, but different colours. It was pretty fun both times, and easy to make. 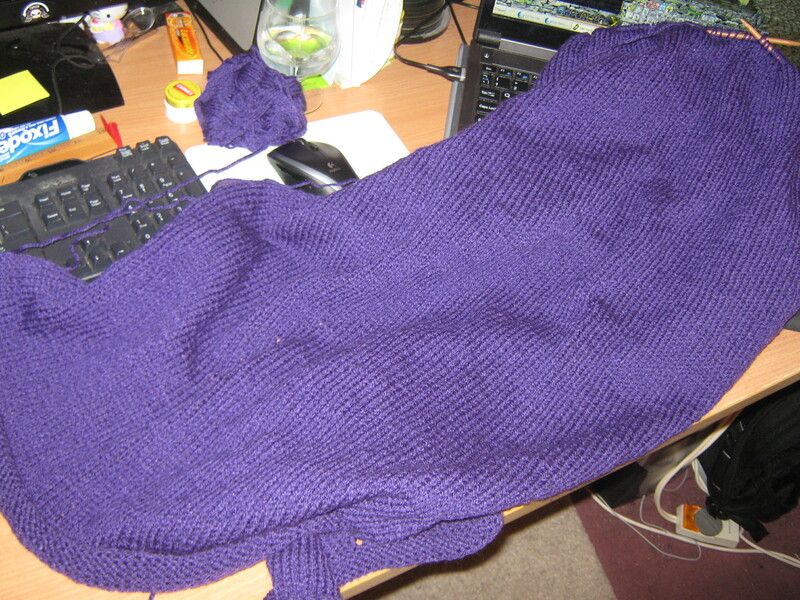 To help pass the time though (and use up a rather large ball of wool), I decided I’d knit a blanket as well. Lilbit has a purple one, so I figured — granny squares for both, purple for both, and all’s fair in crafting and love! For the purple one, I figured I’d go until it was at least 2 feet long, then call it done. and then I decided I’d go until I ran out of wool, or ran out of baby. This was one of those monstrously huge balls of wool… 400, 500 grams? Bigger? And it seems I’m probably going to run out of wool indeed. Ah well! This is one I made with carting the newborn around the house in, so if it’s a bit longer, I guess that’s okay too. I’ll keep going as long as I can, and then find something else to make.